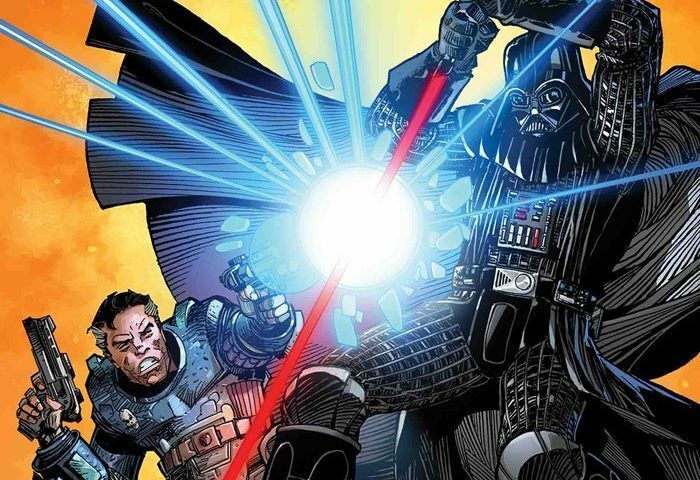 Slightly more than 33 years after the then final issue of Marvel’s Star Wars comic abruptly ended, the publisher is bringing it back around for at least one more issue — for now — featuring a who’s who of canon characters and now-Legends era characters the original series created for the comic book. Star Wars #108 is set for release on May 29. The story, written by Matthew Rosenberg (We Can Never Go Home, 4 Kids Walk Into a Bank, Multiple Man, Black Canary), and featuring art by Giuseppe Camuncoli (Darth Vader Vol. 2), Luke Ross (Star Wars: Age of Republic), Kerry Gammill (Fallen Angels, Cloak and Dagger, Power Man and Iron Fist), Andrea Broccardo (Star Wars Vol. 2) and others, is being published as part of Marvel’s year-long 80th anniversary celebration. The publisher says the story is a “… Legends-era sequel to the legendary comic book writer Archie Goodwin’s ‘The Crimson Forever” story that appeared in the August 1981 issue Star Wars #50 that went on sale in May. The comic, the first double-sized issue of Star Wars, Vol. 1, featured pencils by Al Williamson and Walter Simonson, inks by Williamson, Tom Palmer, Dave Simons, Rick J. Bryant and Simonson, was colored by Don Warfield and lettered by Ed Stuart, John Morelli and Irving Watanabe. The cover was done by Palmer. Missing, for now, from the publisher’s details about #108 is any mention of Lando Calrissian. Rosenberg, in an interview with ComicBook.com, described the one shot has a labor of love, given he grew up reading the 1977-86 series as boy and because it was the first series he collected for himself. While issue #108 is just a one shot, Rosenberg made it abundantly clear that he’d love to play in the Lucasfilm Star Wars comics sand box, including team-ups between Valance the Hunter and Boba Fett as well as Amaiza Foxtrain and Lando Calrissian. Star Wars #108 is out May 29 in comic shops and features covers by Walter Simonson and Carmine Infantino. It’s edited by Tom Groneman and Mark Paniccia. More details should be released about the book when Marvel releases details of its May solicits on Feb. 19. Next article Resistance Reactions: "The New Trooper"
Previous article Poe and Kaz Explore the Unknown Regions on the All-New Episode of Star Wars Resistance, "The Core Problem"